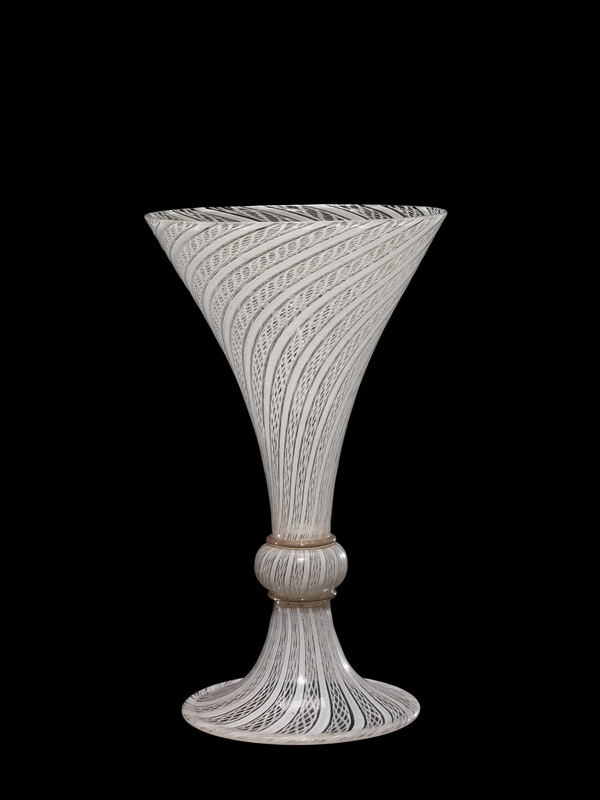 This goblet is made using filigrana, a style of blown glass made with colorless, white, and sometimes colored canes that originated on the island of Murano in the 16th century. The canemaking and glassblowing processes are shown in the video. Making the goblet begins with making the canes, and there are two types on this vessel. A gather of clear glass has been thinly covered with opaque white glass, and again thinly covered, this time with clear glass. The three layers are marvered together. The tip is cooled. It’s joined to a post, and the plain cane is pulled. This cane will be pulled to a length of about 30 feet. The final diameter will be about eight millimeters. The compound cane is made by cutting the plain cane into sections and rolling it up onto a mass of clear glass. A combination of reheating and marvering is used to make the mass perfectly smooth and round. This is attached to a post, pulled, and twisted. The canes are cut into lengths of about six inches. The two types of cane are placed alternately on a piece of kiln shelf and reheated. A post is made on the end of a blowpipe. This is done by gathering glass, blowing a hole to keep the blowpipe open, and then tooling the mass of glass to be cylindrical and to be the correct diameter to allow the canes to be rolled up at its edge. The canes are heated to the point of fusion. They’re pressed together to make sure they’re stuck together nicely and rolled up on the collar. The gap is closed. The vessel is thinly lined with clear glass. This takes place at this moment. This is called the sbruffo technique. Next, the roll-up is reheated, marvered, and divided into three sections. It’s transferred to another blowpipe, and this small section will become the decorative ball or knop between the cup and the foot. After reheating and marvering, the cup is formed by blowing and tooling. The all-important constriction is made between the vessel and the blowpipe, and it’s at this point that eventually the glass will be separated from the blowpipe. The blowpipe is spun so that centripetal force elongates the outer half. The blowpipe is held downward during reheating. This also has the effect of making the vessel taller. The tip is held and pulled with the jacks to create the conical structure that we see. Excess glass is trimmed away. The bottom of the bubble is flattened, and a small amount of glass is added to the tip. This is flattened to become a disk. The disk is tooled so that, at the edge, it’s perfectly flat. 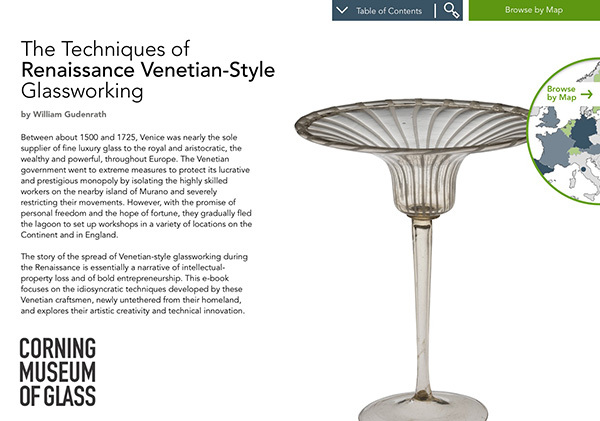 This differs somewhat from the traditional Venetian merese. The tiny bubble is added. This becomes the knop. The remaining glass on the blowpipe will be used for the foot. Another bit of glass is added to form another disk. During this process, the foot bubble has been reheated and softened, and is brought ready for inflation and placement on the second disk. A constriction is made, and this will allow a hole to be created. The excess glass is trimmed free, the glass reheated, and the hole opened. The soffietta is used to inflate the glass further, and with a combination of reheating, soffietta, and jacks, the foot is given its final shape. The foot has an inner fold. The vessel is transferred to the punty (or pontil). The neck is broken. The glass is reheated, and the final rim created. This is done by using the jacks. The edge is trimmed clean. 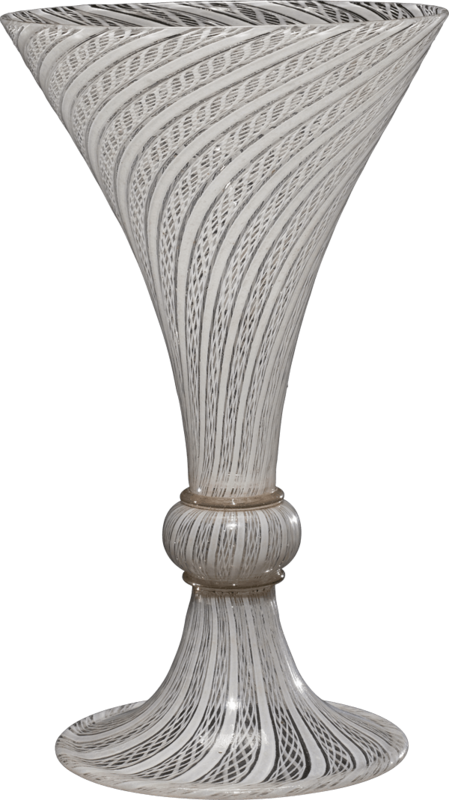 The soffietta is used to inflate the uppermost part of the vessel body, and after thoroughly reheating the glass, the jacks are used to dilate the opening to its final shape. The vessel is flashed in the furnace one last time, broken free of the punty, and placed in the annealing oven for gradual cooling.